This story was sent by Priyanca Vaishnav. To have hailed from and raised in a predominantly oral tradition of storytelling in itself is a story one is proud to have lived. 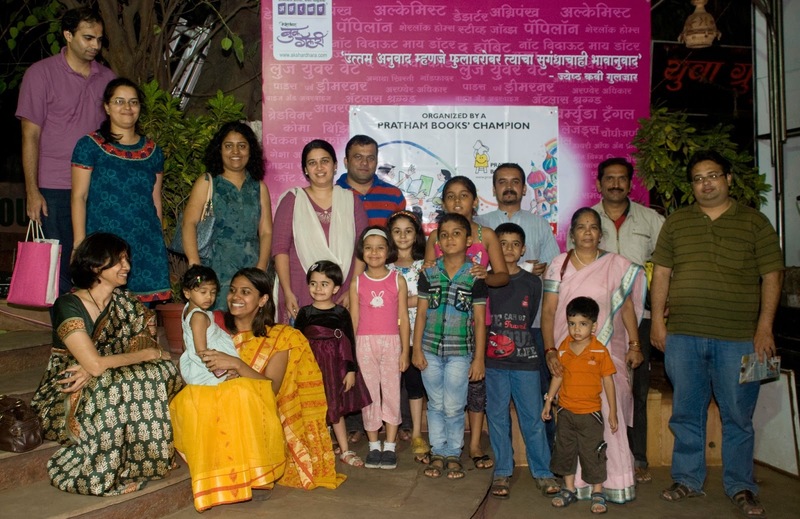 The Pratham Books storytelling session was an event that reiterated this belief. I was filled with pride and silently thanked my parents for handing down the ability to enjoy a tale. us not only with the venue, but also with infrastructure to conduct it successfully. To add to my surprise and glee, the staff courteously directed participants and organizers alike, to not only the session space, but also the books – which was the primary motive of the activity: to encourage reading! flipped through the pages of Susheela’s Kolams, the pictures in the book had captivated them instantly. Unlike most of the other such sessions, ours seemed to have become one of the few that attracted all generations of ‘kids’. The challenge for both Vinay and me as storytellers was, how best to address this motley group? Treat the elders as children, or the other way round? It was a question of what assumptions could be made, whether or not we could make any, and most importantly, not just the story, but we also wanted to get the message across! We used the time right before the session to acquaint ourselves with the kids, more than the parents, and realised they were so much smarter than us adults that we could actually relate time and distance of Pune city itself, instead of sending them into abstract trips of imagination. As a result, while we wanted our listeners to enter Susheela’s word of Kolums, we did not want to belittle or underestimate them. But that is where the colours, the illustrations, the sheer determination of our protagonist came to our rescue. And soon I realised we were really only reading to children – this myriad of ages. To break the ice, and get everyone interacting with each other at the primary level, we decided to start with an Origami workshop. A very beginners’ level, it may have been, but Suniti Bhat – an active member of Orgami Mitra (Mumbai & Pune) conducted it ever so warmly. She concluded the 45-minute introduction to the Japanese paper art by pulling out from her treasure trove of wonders, a sample of an intricate rangoli design that one of her students had created. A yellow-and-green geometrical pattern made with several folded pieces of interlocked paper, the ‘rangoli’ held much similarity to the Kolams we were to talk about in the story. It had been made by a girl who was congenitally visually impaired. the canvas of our minds and reliving that nostalgic memory of our collective childhood. 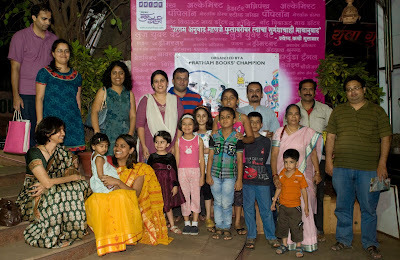 The story was shared in Marathi first, and subsequently in English. The children’s wows and sparkling eyes at the mention of the huge kolams of the sky were of course a big encouragement. But our biggest achievement was to watch even Varsha, the Marathi translator of the book, raising her brows and listening in rapt attention. The staged telling of the tale garnered an affirmative response when at the end of the session we had conversation with several members of our audience about spreading literacy. As they say, happiness grows when shared. The kids wanted to share the story. I believe some did, because I continued to receive calls of inquiry for a whole week after the event! Thank you Priyanca for spreading the joy of reading!